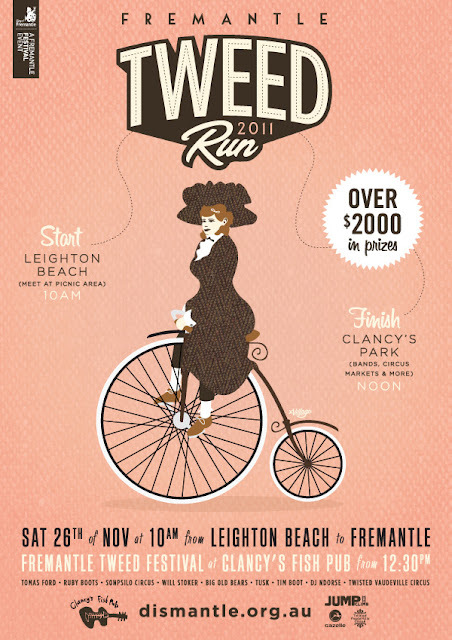 Good news for all those vintage minded cyclists looking to be participants in the 2011 Fremantle Tweed Run. The event this year is going to be bigger and better than ever!! It will take place on Saturday November 26 and is to commence at Leighton Beach at 10.00am. The group will then cycle to the lawns near Clancy's Fish Pub, Cantonment Street, Fremantle, where there will be a cycling festival of food and entertainment arranged by the Dismantle Bike Group. Please keep an eye on these links for more details as the event date approaches. .....so pimp your vintage ride and raid your local recycled clothing store to kit yourself out in gear suitable for such a prestigious event.﻿...tweed vests, bow ties, and period clothing only please. James @ Perth Vintage Cycles. I really like the poster for this one. Nice design!